← Wear the damn dress! Be fabulous! 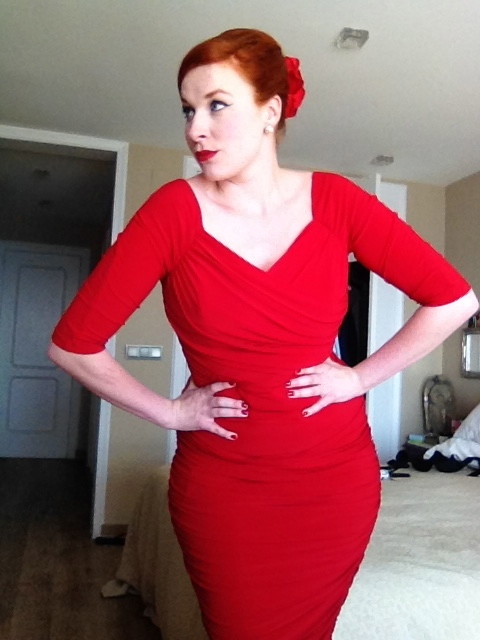 So here it is… My long overdue review of the dress of all dresses… The pièce de resistance of Pinup Girl Clothing, the va-va-voom-dress every pinup girl should own, her royal highness Monica. 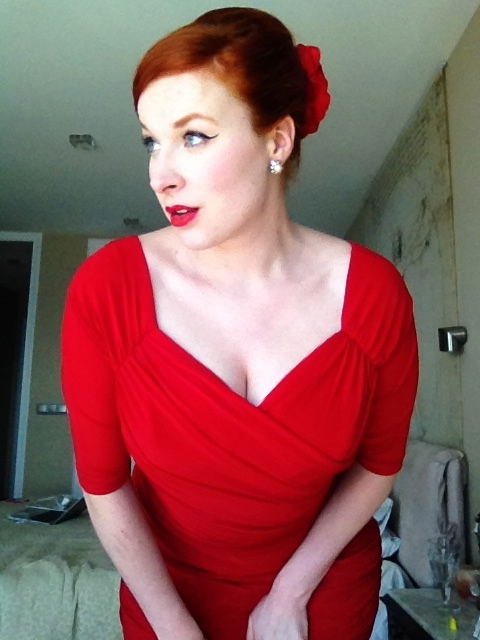 This dress has obtained a true pinup girl cult status over the years, and rightfully so might I say! I had been lusting over this dress forever… I finally went ahead and bought it, and I can’t believe I waited so long! If you are looking for a dress that will make heads turn, make you look and feel like a million bucks, has the comfort of your pajamas, break hearts and will be in style forever, Monica is your girl! So what makes this dress so special? Like all PUG items, the quality is high and the designs are very well thought through. PUG overlord Laura Byrnes is responsible for this piece of art and oh my, should we be thankful for it. At the first touch, before even trying it on, you will feel the weight of the dress. Because there is a lot of fabric going into the dress. The outside is a draped fine knitted fabric, that will wave around your body and the inside has a bengaline shaper, that will hug your figure at the right places and correct and sculpt your figure where needed. It’s perfect for every size and every type of body, since it will form to your body and will always look amazing. On the hanger, the Monica dress at first will look quite small, because of the bengaline shaper inside, but once you wiggle into it, it will become like second skin, and you won’t want to take it off! The dress comes with three-quarter sleeves that can be worn on- and off-shoulder. On the inside, around the neckline and shoulders there’s a plastic gummy like lining, like the ones you could find in a strapless bra, to keep the shoulders in place. This makes the dress ideal for wearing it with a normal bra, a strapless one or maybe none at all! For me the length is ideal! It comes all the way down to about a couple of centimeters under my knee, making it a very tall-chick-friendly dress! I have bought the dress straight from the PUG website and following their size chart I was in between L and XL, but because of my bust advised to get an XL, so I did. Looking back I would have definitely sized down to an L, I feel it would have made an even better effect with the bengaline shaper. So if you are thinking of purchasing one, size down! 🙂 The Monica Dress comes in many colors and is one of the most beautiful dresses I have ever owned. So if you don’t mind investing in a dress knowing it will last a lifetime and you will love it forever I suggest you go buy one straight away! Hi doll, I have been looking for a red dress to wear for my graduation June 22nd and fell in love witg this dress. I was wondering, are you selling it?